RYA Day Skipper Tidal Courses in Gibraltar. If you’ve already completed your RYA Day Skipper Theory course, the last hurdle is the five day Day Skipper practical assessment. And where better to do it but in tidal waters with the sun shining! You'll learn all about Mediterranean mooring techniques and custom procedures too. Gibraltar and the surrounding Mediterranean waters are a perfect sailing playground. If you intend to charter yachts in the UK or Med in the future, it makes sense to spread your wings and choose Jolly Parrot to complete this stage of your training and achieve the coveted International Certificate of Competence which will allow you to charter yachts worldwide! If you’ve yet to book your RYA Day Skipper Theory course, we’d recommend our popular RYA Day Skipper FastTrack course which combines the theory and practical qualifications with just one week off work. With RYA Day Skipper Theory firmly under your belt, now‘s the time to join a training yacht to put it all into practice. Under the guidance of our RYA instructor, you’ll be taking on all aspects of skippering a yacht – including sail trim, stern-to mooring, pilotage, passage planning, anchoring and safety management on board. As part of the course you’ll have the chance to develop your leadership skills by taking charge of a short passage. But don't worry! Our instructor will remain on hand to give advice and encouragement and ensure your safety. Knowledge and experience to RYA Competent Crew, plus knowledge to RYA Day Skipper Theory level. Upon successful completion you’ll be awarded the RYA Day Skipper Practical (tidal) certificate. The Day Skipper practical certificate also enables you to apply for an International Certificate of Competence (ICC). Sunday to Friday: 20:30 hrs on Sunday evening until 16:30 hrs on Friday afternoon. Tuesday to Sunday: 20:30 hrs on Tuesday evening until 16:30 hrs on Sunday afternoon. Ideal for beginners. This 14 day course combines the RYA Competent Crew, RYA Day Skipper Theory and RYA Day Skipper Practical. 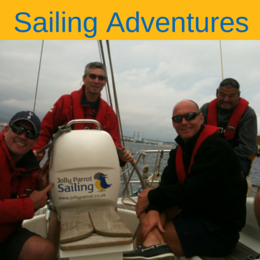 Click here to see our Novice to Day Skipper course. 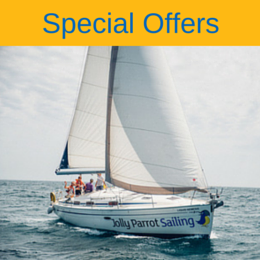 Ideal for those who have RYA Competent Crew certificate or similar experience. This 9 day course combines the RYA Day Skipper Theory with the RYA Day Skipper Practical course. Click here to see our Day Skipper Fastrack course. Being a qualified Day Skipper will allow you to charter yachts all around the world and sail within the charter company's specified range from a safe haven. Although this is enough for many people, the next step is the RYA Coastal Skipper Practical course. or our bespoke RYA Coastal skipper combined course. The RYA Coastal Skipper qualification will allow you to undertake more difficult/longer passages by day and night, handle the yacht in more demanding conditions and progress along your journey to the prestigious level of RYA Yachtmaster Coastal.